Anne Hansen. 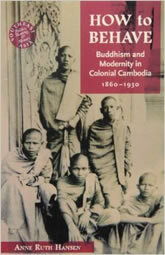 How to Behave: Buddhism and Modernity in Colonial Cambodia, 1860–1930. University of Hawai'i Press, 2007. This ambitious cross-disciplinary study of Buddhist modernism in colonial Cambodia breaks new ground in understanding the history and development of religion and colonialism in Southeast Asia.